I received a Honey Glazed Spiral Sliced Ham from Tender Filet. Upon arrival, it was in a box packed with ice packs to assure freshness. I immediately put it in the refrigerator. It was a few days later before I decided to cook the ham. I removed the ham from the packaging with little effort. It was tightly wrapped in plastic with an overlay of netting. Upon seeing the actual ham itself, my mouth began to water. This ham looked and smelled scrumptious. It was a 9-11pound ham with a "secret" brown sugar and honey glaze. It looked amazing. Tender Filet takes the time to trim the ham just right and this was no exception. I proceeded to wrap the ham in the standard aluminum foil and bake according to the directions included.. As the ham cooked, the aroma inside my home was amazing. Since I had some time on my hands, I started preparing the dishes I planned on serving with this wonderful smelling ham. Upon taking the ham out of the oven and uncovering it, it was PERFECT! I took a piece of the spiral sliced ham to "taste test". It was out of this world! Talk about tender, moist, and delicious, this ham was by far the best I have ever tasted. Tender Filet really surprised me with this ham. I really like the "fired-in" flavor they create when cooking the hams. This makes for THE best ham I have ever tasted. It is easy to cook, it tastes wonderful and serving is as easy as cooking it and putting it on a platter. The Honey Glazed Spiral Sliced Ham was a hit in my house. My entire family was absolutely astounded at the taste of this tender and moist. 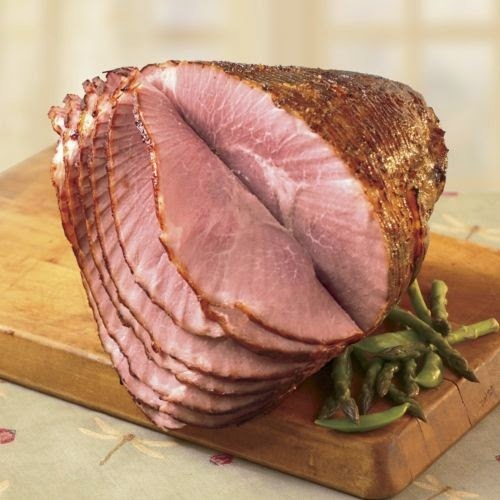 I would highly recommend that if you are looking for the perfect ham for Easter, check out Tender Filet. They have just the right size ham for any family. This ham comes in three different sizes. Hurry and order one here before April 9th to assure you get it in time for Easter. And now for the best part! 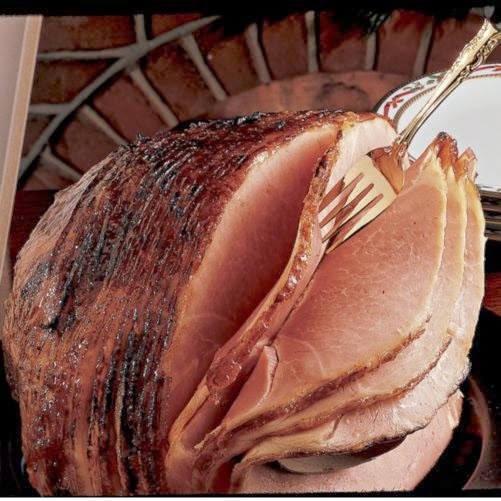 One of my readers will win a Honey Glazed Spiral Sliced Ham from Tender Filet. Make sure and enter via the Rafflecopter below. Don't forget to come back for those daily entries. Be sure to check out Tender Filet. They have more than just hams. They offer a variety of meats,, seafood and more. Reviewz & Newz is not responsible for shipment of this prize. Winner has 48 hours to respond to email or another winner will be chosen. Images courtesy of Tender Filet. Their Pork Osso Buco looks wonderful! I like the Top Sirlion in a Roasting Bag! I like the look of just about everyting, I can't pick! I would like the Ham & Big Red Cheddar. I would love to try the Steak & Lobster Feast it looks so yummy. I'd also like the Fork-Tender Beef Stew. The Tipsy Bourbon Pecan Pie sounds so yummy!! We do Ham and Scalloped potatoes. My family loves ham. I definitely would choose the Masterpiece Baked Ham! It looks incredible! Would love to cook the Boneless Leg of Lamb for Easter dinner, yummy. I like to usually cook a ham. The Ham would be perfect for Easter Dinner. I'd like to make the Chicken Breast Cordon Bleu. The gourmet stuffed chicken trip looks delish! Lots of good looking options though. I would love to serve the Boneless Leg of Lamb for Easter. I would like to cook the Boneless Leg of Lamb for Easter. The Top Sirloin in Roasting Bag looks wonderful! I like the honey glazed spiral sliced ham. Yummy. The rib eye steak looks yummy!! I would love their Chicken Breast Cordon Bleu for easter dinner. I would like to cook with Dutch Crust Sweet Potato Casserole. I would love to have the strawberry shortcake cheesecake for our Easter dinner. thank you! The Jumbo scallops would be a hit at this house. Every day I come here to tweet, I drool, a lot! I would cook the Honey Glazed Sliced Spiral Ham. I'd cook Honey Glazed Ham of course! With lots of fresh, spring veggies and a pretty fruit tart for desert. I love ham so I would love to make the Honey Glazed Spiral Sliced Ham from this site for my Easter dinner. I would cook the bone in prime rib. Honey Glazed Ham would be on our menu! Id like to try the pork tenderloin in a roasting bag. I would like to make the Honey Glazed Spiral Sliced Ham. I would like the Boneless Leg of Lamb for Easter. I would make the Honey Glazed Spiral Sliced Ham. I'd like to cook the Rosemary Lamb Shanks. Would love to fix the Stuffed Pork Loin Roast!! We usually do a Spiral cut Ham but I would love to try a Tur-duc-hen sometime! definitely the top sirloin in roasting bag! I'd love to try the succulent lobster tails! Yum! I would like to cook the Pork Loin Roast for Easter. I am such a sucker for a good Filet Mignon. I would love to make the boneless prime rib! I love making glazed ham. I would like the rosemary lamb shanks. i would love to make the bacon wrapped filet mignon. I would like to cook the Best Collection items for Easter dinner. I like to try their Tipsy Bourbon Pecan Pie for Easter. Definitely ham. Spiral sliced or any other type. Honey Glazed Spiral Ham is my pick !! I would love the Maple Mashed Sweet Potatoes! My family favorite with a sweet twist! I would like to make the Tur-Duc-Hen since I have never tried it before. I would like the Marinated Duck Breast in Honey Flavor. I would like to cook the boneless leg of lamb, but my husband doesn't like lamb, so the bone-in prime rib looks good. I would love to make the wild rice pilaf with the sliced ham. yummm! Lobster Bisque by Phillips would be fun to have! I would love to cook the Gourmet Stuffed Chicken Trio! I would like to cook the stuffed shrimp. hard choice but I'd go with the Stuffed Cornish Hen. Looks yummy! I'd try the stuffed shrimp! I would like the lobster tails. i like potato salad. i am tony l smoaks on rafflecopter. The Boneless Leg of Lamb would be perfect for Easter! I would have to say the honey glazed spiral sliced ham with some of those garlic mashed potatoes! It all looks so good! Would love to cook some Bacon Chicken Breast Jalapeño Poppers! I would love to cook the bone in prime rib. I would love to try the Steak & Lobster Feast! we would cook the honey glazed spiral ham. The stuffed shrimp would be a great appetizer for Easter dinner. I would love to share this ham with my family. I would like to make the Tur-Duc-Hen with Dutch Crust Sweet Potato Casserole, Thai Ginger Carrots and Tipsy Bourbon Pecan Pie for Easter. Looks good and I'm sure the taste would be out of this world. The bon in prime rib looks yummy! The Dutch Crust Sweet Potato Casserole looks amazing and I would love to offer this for Easter. I like the bone in prime rib. It looks delicious. Ham is a tradition here and I would get their Boneless Spiral Sliced Ham. Thanks for having this contest. The Boneless Spiral Sliced Ham & the Deep-Dish Caramel Apple Pie look amazing!! Thank You for the awesome giveaway! !